A little girl handed me a limp, browning dandelion the other day. “You need to put it in water,” she said, smiling hopefully. I knew the sentiment all too well. How often had I fallen victim to the lure of a lawn strewn with fuzzy golden flowers and picked handfuls to stuff in jam-jars, only to discover how short-lived their splendor was once picked. For the past week, on sunny days, I’ve taken a bowl out to the garden and plucked the heads off the freshly opened dandelions. No, it’s not some manic, pesticide free attempt to remove them from my lawn. I’m storing them in bags in my freezer until I’ve accumulated enough to give to a friend to make dandelion wine. I can’t wait to taste the results. 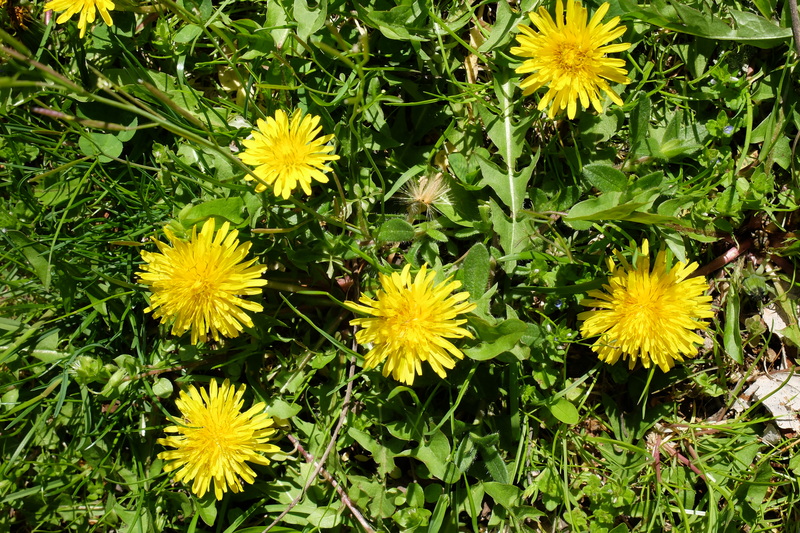 The name, from the French dent-de-leon, or lion’s tooth, refers to the jagged shape of the dandelion leaves. When I was a kid, I spent hours picking these greens to feed my pet rabbit and tortoise. I learned early on that the white sap that oozes out of the stem is not only sticky, but permanently stains clothing brown! But I still can’t pass a lush bunch without having the urge to pick them. Packed with vitamins and minerals, these leaves make a delicious dish. I first tasted horta—spring dandelion leaves cooked with tons of garlic and lemon juice and olive oil—when living in Greece as a child. The dandelion has been used medicinally for centuries, and all parts of it are edible. One of its many names is pee-the-bed, for the diuretic effects of ingesting the dried root. It’s far from being merely a humble weed, and yet, this is the plant that herbicide makers love to target in their advertising. Of the numerous names for the dandelion, found in most languages, my favorite is from the Persian, qasedak, meaning small postman because it brings good news. This entry was posted in Childhood Adventure, Photography, Woman With Landscape, Write Eejit, Writer's world and tagged dandelion, dandelion wine, gardening, horta, medicinal uses, memoir, nature, photography, spring, writing on May 9, 2014 by Melissa Shaw-Smith. I really enjoyed this post, in spite of the fact that I have been battling dandelions constantly over the past few weeks. I mow, and the next morning there are numerous seed balls standing much higher than the mower cuts, in full defiance of my efforts. Think I’ll go the wine route next year! Let us know how it goes. Thanks! Yes, I’m curious to find out if the wine will have a bitter aftertaste, or if it mellows with age. Ooh, bring some of these dandelion wonders Thanksgiving. I love this idea, taking an every day object, writing about it, and including all sorts of interesting tidbits. I may try it myself. Thanks, glad it inspired you. On that note, I’m reading bill Byson’s At Home: A Short History of Private Life which looks at every day objects too. Good read! My green iguana, bored with the grocery store collard greens which are her staple diet through the winter, loves her spring outing at the U-Pick Dandelion Farm (my front yard). Dandelion greens are a very healthy food for iguanas! Good to know. Now to see if I can get my kids to eat ’em! Wow! You talk about dandelions! Lovely! And You know horta! I wonder, did You like them as a kid? I was collecting them when I was a kid with my parents ( we are greek 😉 ) , but they where too bitter for me as a liitle one. Now as an adult I adore them and all kind of horta. I make them only with lemon, no garlic. And it’s best to use the young little leaves in spring, there are less bitter. 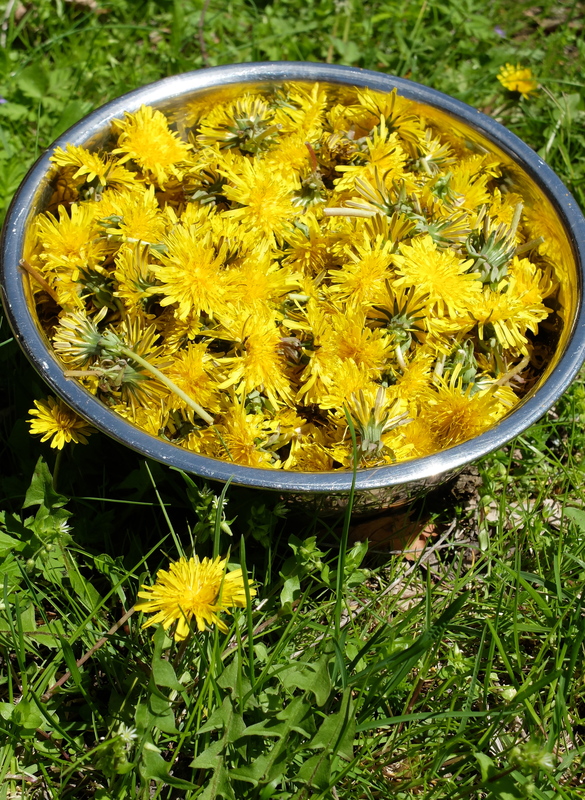 maybe it would be great for your kids to make a dandelion “honey”? It is not really honey more a sweet dandelion sirup. If You are interested I can share the “honey” recipe. Thank you. And yes, I’d love to see that recipe for a “honey” syrup made from dandelions. I’m intrigued!